Source: New York Aurora 1842-03-29: . Our transcription is based on a digital image of an original issue. Original issue held at the Paterson Free Public Library, Paterson, NJ. For a description of the editorial rationale behind our treatment of the journalism, see our statement of editorial policy. Cite this page: Whitman, Walt. "Prospects of War." 1842-03-29. The Walt Whitman Archive. Gen. ed. Ed Folsom and Kenneth M. Price. Accessed 20 April 2019. <http://www.whitmanarchive.org>. As before has been asserted by us, we do not wish for war. We have full consciousness of the horrors of bloodshed, the miseries of devastation, and the derangement of business, that must inevitably follow in the path of warlike demonstrations from this country to England. We should therefore regret war; in the same way we should regret some terrible surgical operation performed upon the limb of a friend. 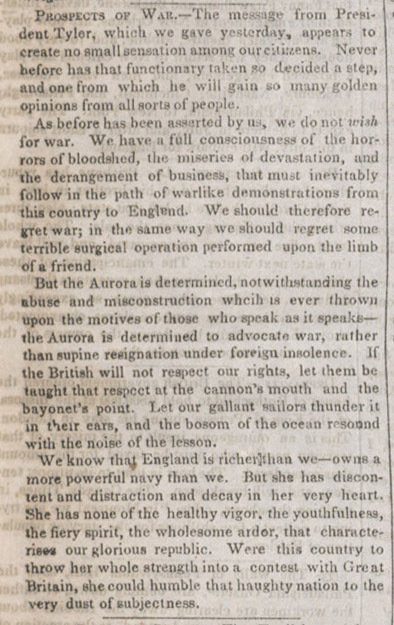 But the Aurora is determined, notwithstanding the abuse and misconstruction whcih is ever thrown upon the motives of those who speak as it speaks—the Aurora is determined to advocate war, rather than supine resignation under foreign insolence. If the British will not respect our rights, let them be taught that respect at the cannon's mouth and the bayonet's point. Let our gallant sailors thunder in their ears, and the bosom of the ocean resound with the noise of the lesson. We know that England it richer than we—owns a more powerful navy than we. But she has discontent and distraction and decay in her very heart. She has none of the healthy vigor, the youthfulness, the fiery spirit, the wholesome ardor, that characterises our glorious republic. Were this country to throw her whole strength into a contest with Great Britain, she could humble that haughty nation to the very dust of subjectness.